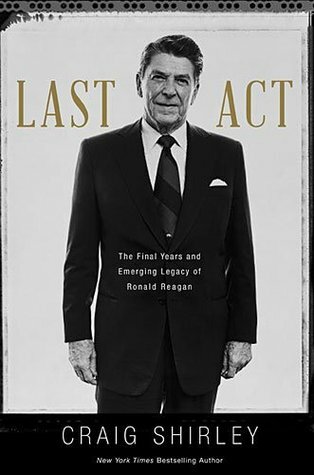 “Last Act: The Final Years and Emerging Legacy of Ronald Reagan” by Craig Shirley was published in 2015. This is one of four books he has authored focusing on Reagan’s national political career and retirement. Shirley is an author and pubic affairs consultant, a member of the Board of Governors of the Reagan Ranch and a Trustee of Eureka College. His most recent book “Citizen Newt: The Making of a Reagan Conservative” was published in 2017. There is no shortage of biographies covering Ronald Reagan’s long and extraordinary life. But prior to Craig Shirley’s book reviewing his post-presidency, no one had attempted to focus on the last fifteen years of Reagan’s life in quite as deliberate a way as Douglas Brinkley did with Jimmy Carter in his excellent (if premature) book on Carter’s retirement years. The potential for a thorough and systematic examination of Reagan’s retirement years and legacy is enormous. And coming a decade after Reagan’s death – with the chronological distance needed to critically assess his legacy – the timing of Shirley’s 324 page book seems ideal. Unfortunately, this book falls well short of its promise. “Last Act” is far less an exploration of Reagan’s retirement and legacy than it is a detailed review of the week between Reagan’s death in June 2004 and his interment, including the planning for his state funeral in Washington and a private service in California. And while this part of this book is often poignant and revealing, most of the remainder of the book is disappointing. At a high level the book proceeds chronologically from Reagan’s death through his burial in Simi Valley. But chapter-to-chapter, and even from one paragraph to the next, the narrative has a habit of jumping back and forth in time without warning…collecting various bits of Reagan’s life in an attempt to create context. What results, however, is not a coherent stream of thought so much as a disjointed and seemingly random stream-of-consciousness. Adding to the disappointment is the author’s tone which is frequently hyper-partisan (or breathlessly defensive). More than a few presidential biographers are unable to conceal their political sympathies or bias, but Shirley’s political perspective infuses the narrative so aggressively it becomes a distraction. He excoriates a wide range of targets for their insufficient appreciation for Reagan: Hollywood, the media, Edmund Morris, New York City’s municipal government, “elites,” the Nobel Committee and even high school history textbooks. The time Shirley wastes avenging a seemingly endless array of Reagan-directed slights could have been better spent reviewing the enormous impact Reagan had on the world, more carefully observing his retirement, and comprehensively assessing his legacy. Instead, the productive years of his retirement are only haphazardly covered and his legacy is just briefly addressed in an Author’s Note at the end of the book. Overall, Craig Shirley’s “Last Act: The Final Years and Emerging Legacy of Ronald Reagan” is a touching review of Reagan’s death, funeral and burial in California. But readers expecting a thoughtful (if sympathetic) exploration of his post-presidency and legacy will be disappointed. “Last Act” is too often a rambling mess more concerned with vindication than analysis or persuasion. I enjoyed the book more than you did, but must admit it was written for admirers by an admirer. For anyone else it’s too much detail on a funeral! I also struggled with this book, not because it didn’t offer anything of interest, but because it set up expectations so completely different from what it was. As you point out, it was far from a comprehensive review of the last phase of his life, and was primarily a detailed look into the days after his death, as well as a lot of commentary on what the commentary was during that time. It lacked focus and consistency, and came across as conversational, as if you were enjoying a meal with someone who had some interesting insights to share, but were unorganized and kind of a pot luck of thoughts and ideas. I still found a lot to love in individual stories and recollections that were published here for the first time, but it was far from what I was hoping–a true look into the phase of his life after the presidency and a look into his declining years with Alzheimer’s. On a personal note, I was reading this for a review late one Saturday night and read some particularly poignant insights into Nancy during this time. Inexplicably, I remember being vividly overcome with emotion as I pondered how truly joyous their reunion would be upon her own passing, and reflected upon what a close and committed marriage and friendship they had. With as much reading and research as I’ve done on Reagan, it was a little unusual to be moved the way I was this particular night by sentiments I had researched so many times before over so many years. It was about 8 hours later as I woke up on Sunday morning that I heard the news that Nancy had passed away that night and I ended up penning a tribute that was inspired by the thoughts I had the previous evening. Your third sentence PERFECTLY summed up how I felt. My expectations were misaligned with the book’s mission…and the flow / structure was a bit of “a pot luck of thoughts and ideas.” I couldn’t have said it better!